Who are the Bakraoui brothers, blamed for Brussels attacks? The Bakraoui brothers were known criminal thugs to Belgian authorities, but it wasn't until shortly before they blew themselves up on Tuesday in a pair of attacks in Brussels that left dozens dead that officials knew they were also violent extremists. Federal Prosecutor Frederic Van Leeuw identified Wednesday only two of the four suspected bombers in the deadly Brussels attacks, and they were Khalid El Bakraoui, 27, and Ibrahim El Bakraoui, 29. The two Belgian citizens had both been arrested previously, but not for related crimes. Khalid was given a five year prison sentence in 2011 for armed robbery and car theft, according to French newpaper Le Monde. Ibrahim was sentenced to nine years in prison for opening fire on policemen using a Kalashnikov during a burglary in 2010, according to Belgian newspaper DH. It is not clear when he was released, nor why. RTBF said Khalid El Bakraoui rented the apartment in the Forest neighborhood of the Belgian capital, using a false identity, that was raided by police last Friday in an operation that led to the arrest of top Paris attacks suspect Salah Abdeslam. 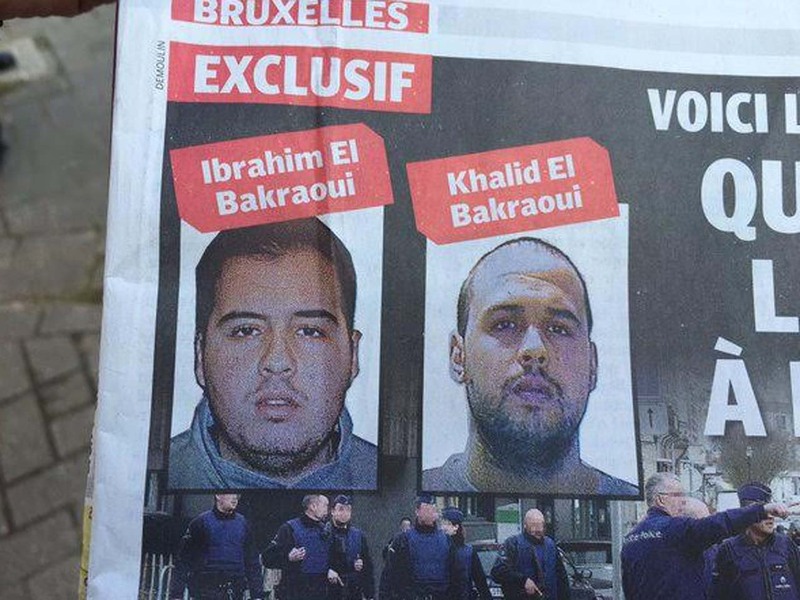 Several Belgian news outlets reported last week that the Bakraoui brothers had been wanted since the March 15 raid. Interpol had also issued a "red notice" for Khalid's arrest, but it's not clear when exactly that was released. Khalid is listed as having dual Belgian and Bahamian citizenship. It was not clear why the authorities had not asked the public to help find them. What is clear is that shortly before 8 a.m. on Tuesday, Ibrahim and two other men walked into the airport in Brussels with the intent of blowing themselves up in the check-in area. One of the three men escaped without detonating his bomb, officials have said. About an hour later, Khalid blew himself up in a subway station. It's not clear whether Khalid went to the airport first, nor what exact role the two had in planning the attacks. Police discovered a computer in a trash can in Ibrahim's neighborhood that is reported to have contained both a will and a note saying that people were looking for him everywhere and that if he gave himself up he would end up in a cell. Neighbors of Bakraoui brothers expressed shock and bewilderment at what happened. John Valderrama lived across the hall from the brothers in the Schaerbeek neighborhood, but said he never heard anything suspicious. He said he only saw one person come in or out of the fifth-floor apartment. Valderrama said "when I saw them I went 'Whoa!"